Sue's SuperNutrition opened their family owned business in 1995. Sue Gibson, owner started into natural health when her son had food allergies over 38 years ago. Sue's SuperNutrition store is over 3,000 square feet. Sue's has a large selection of quality vitamins, herbs, homeopathy, all natural skin care, natural make-up, aromatherapy,and more. 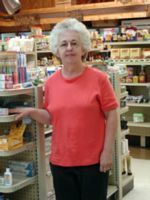 Sue's carries a full line of products, organic health foods, wheat & gluten free foods, allergy foods, organic bulk herbs, organic coffee, bulk foods, large natural tea selection (one of the biggest you'll see), frozen foods, organic meats, free range eggs & chickens, & so much more. Sue, Tracey and Dickie are here to help you with your Vitamin, Herb, Hair and Skin care questions.